There are many nicknames for tall guys, and as a six-foot tall guy in 9th grade, I have heard a lot of these nicknames. Surely, there are several ways to come up with nicknames for a guy, but when you stand taller than everyone in the room, all your nicknames are going to be based on your height. Some of these nicknames are cute, some are funny, I have to admit, I had some cool nicknames as well. But some are just downright mean nicknames. Till date, when I run into people from high school, they still prefer to call me by these nicknames. I suspect most of them never learned my actual name. But being a tall guy has its advantages. A significant advantage of being a tall man is that women are more attracted to tall men. Several studies have tried to explain why women love tall guys and I suspect short guys conducted these studies. Because why else, would you dedicate time and resources to explore why ladies love tall guys. 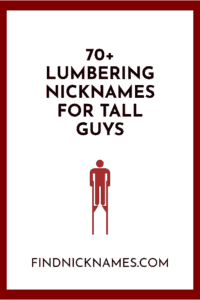 In this article, I’m going to share several nicknames for tall guys. So if you need cute nicknames for your tall boyfriend, brother, friend or any tall guy you know, you will find a good pet name for him from this list of nicknames to call tall guys. I feel like this list is missing some great nicknames for skinny guys. So, if you know any good name for tall guys that’s not this list, even if they are offensive names for tall guys, go ahead and add it in the comment section.